An assortment of antique tools and household items, along with prices and values. A witchpost from East End Cottage, Egton. Witch posts are almost exclusively a feature of the North York Moors region. It is a solid upright timber of oak or rowan wood which is built as part of a house’s structure, often by the fireplace. It has a carved cross near the top of the post and it is thought their purpose was to protect the house and its inhabitants from witches. 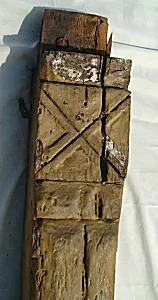 It has also been suggested that itinerant priests in the 17th century who sheltered in the house may have given a blessing on the house and its inhabitants, the occasion being recorded by the carving of a cross on one of these posts. Whatever, the custom is of remote antiquity and a remarkable relic of superstition. There is very little information to be found on witchposts, but one lengthy article can be found here by noted author Peter Walker. It poses some questions and has a few more theories on this interesting subject. 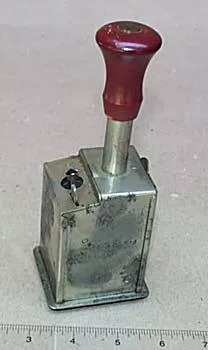 This is a Korn Krusher 1 1/2 made by Simmons Hardware Company. The Korn Krusher was made to crack corn for the farm chickens. This long hammer is a poster hammer! Looking at the other side of the head of the hammer, a slot held the tack or nail so it can be used high on the wall. Also visible is part of the clip that actually held the poster so it could secured to the wall. All I can say is that it made perfect sense to me when it’s use was explained to me as I held the hammer. 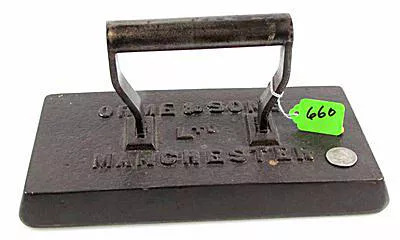 American Bull Dog Boot Jack sold by Tom Harris Auctions. A handcarved Whetstone holder. This might be used as a farmer works the fields. 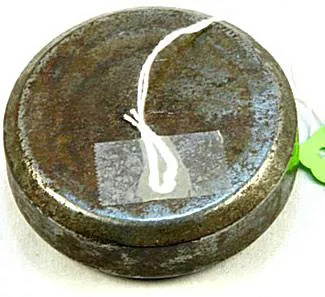 The “barrel” portion would be filled with water to hold the stone, the hook would hang on his belt and when he stopped to use the whetstone, the pointed end would be put into the ground to hold it upright. 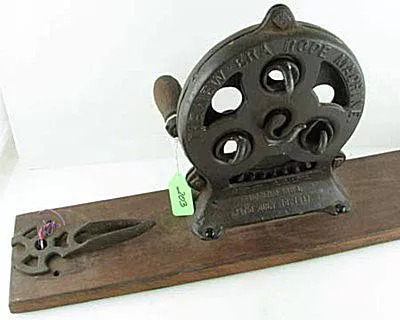 The New Era Rope Machine manufactured by A.D. Long of Fairfield, IA. 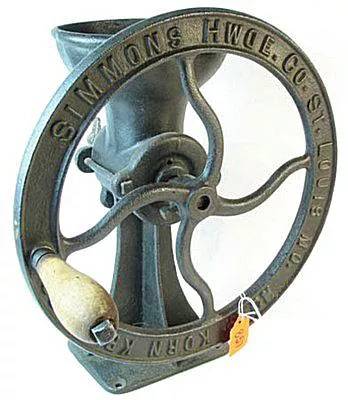 Another fun treasure from Simmons and Company Auctioneers! Note: the string is holding the auction lot number and is not part of the actual piece. This was part of the Mystery Antique of the Week series. 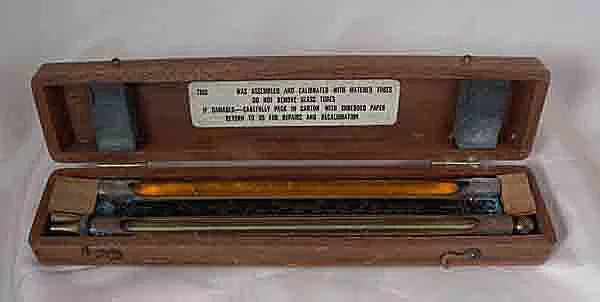 Used by British Meteorological Office to record the duration of sunshine as the sun moves across the sky. 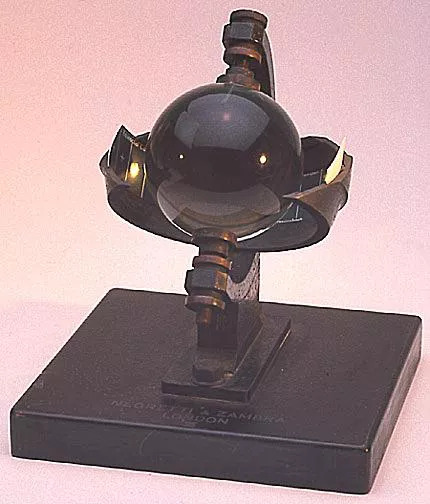 An English piece engraved on the top of the black slate base “NEGRETTI & ZAMBRA, LONDON.” This Campbell-Stokes sunshine recorder consists of a 4″ diameter glass sphere mounted concentrically in a section of a spherical bowl, the diameter of which is such that the sun’s rays are focused sharply on a card held in grooves cut into the bowl. There are three overlapping pairs of grooves, each to take cards suitable in shape for different seasons of the year. Thanks go to The Gemmary, a fascinating website dedicated to serving the serious scientific instrument collector. 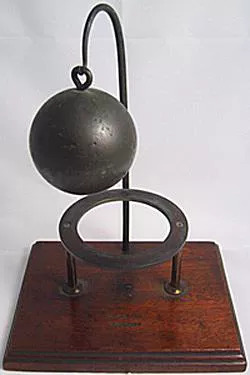 The ball will not pass through the ring unless ring is heated, demonstrating that heat expands solid bodies. 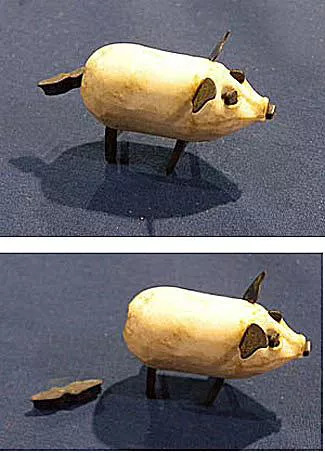 Ceramic pig was given out by a pig association many years ago. It’s a bit sadistic, it was made to put flies in the pig and the flies would cause the ears and tail to wiggle. From Denise Stanco:It’s a Qalandan! An antique travel brass inkwell used in the late 19th century through early 20th century, these have dated back to the 15th century. It has a compartment to hold quills and has an attached inkwell (powdered ink). The set on the left (B) was part of the Mystery Antique of the Week series. This is was part of the Mystery Antique of the Weekseries for January 26, 2011. Quickly and conveniently, the VISGAGE checks oil viscosity on-site; without thermometers or stop watches. The VISGAGE can be used to check any oil from a light spindle oil to heavy gear oils. This is was part of the Mystery Antique of the Weekseries for February 9, 2011. An “eraser” that would gently scrape off the layer of ink on paper. The piece has a sharpened edge for that purpose. This is was part of the Mystery Antique of the Weekseries for March 2, 2011. Before metal pen nibs, there were goose quills, which had to be cut to shape. As Alan, one of the correct guesser in the Mystery Items quiz so aptly put it. “To write with a goose quill, the penman needed to first cut the quill’s tip into a particular shape and then cut a further slot up that point. To accomplish this, it was common practice to carry a small pocket knife at all times… Hence the term “Pen Knife” that has come down to us till this day. This is was part of the Mystery Antique of the Weekseries for March 16, 2011. This is was part of the Mystery Antique of the Weekseries for March 23, 2011. 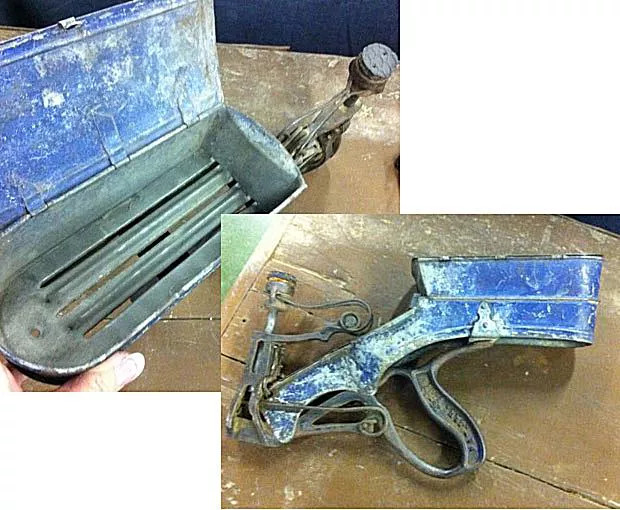 An early manual nail gun, with two two patent dates on the piece, 1892 and 1908. The nails slid down the slot and are then held up to be hammered. 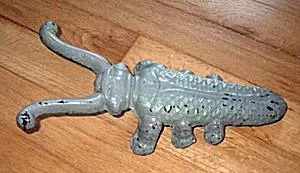 This is was part of the Mystery Antique of the Week series for April 27, 2011. An unusual looking antique pencil sharpener. Even looking at it, it’s hard to figure out how it might work. And apparently that’s the problem, it didn’t work very well. They were produced during the hey-day right after the turn of the century and sold for a $1.00 according to ads. To operate you put the pencil in the front and pushed down on the plunger —– repeatedly. The pencil would rotate and a round blade inside would shave and sharpen the pencil. It was not only supposed to sharpen the pencil, it was also set up to sharpen the blade with a small stone inside. This antique was featured as a Mystery Antique of the Week on May 11, 2011. 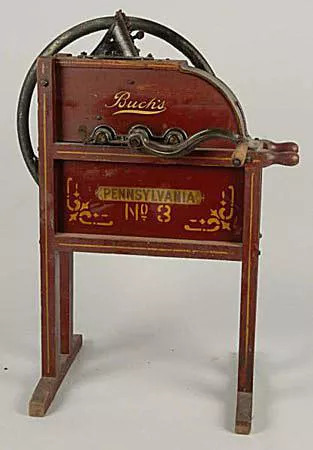 Corn sheller with a hand crank with stenciled wood stand. This antique was featured as a Mystery Antique of the Week on June 29, 2011. Wagon Wheel Spokeshave which is used to shape wooden round parts, e.g. 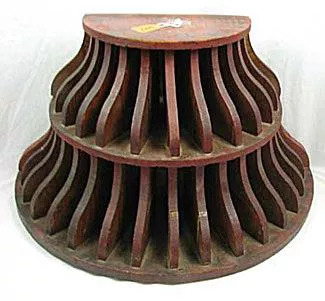 the spokes of the wagon, chair parts such as spindles or rungs. 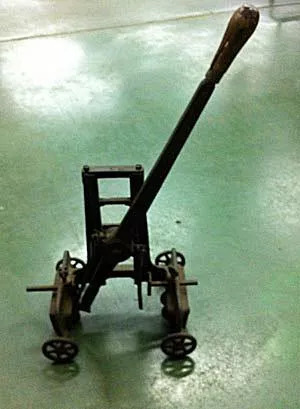 This antique was featured as a Mystery Antique of the Week in October 2011. 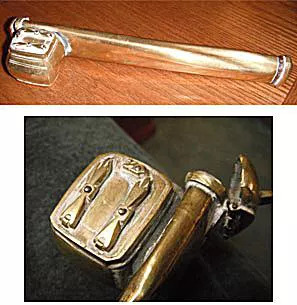 This is an antique Door Lock Mortiser, used to make the opening in a door for a lock. 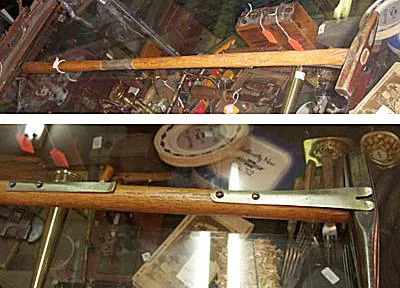 The collector advises that these are hard-to-find and typically sought after by tool collectors. 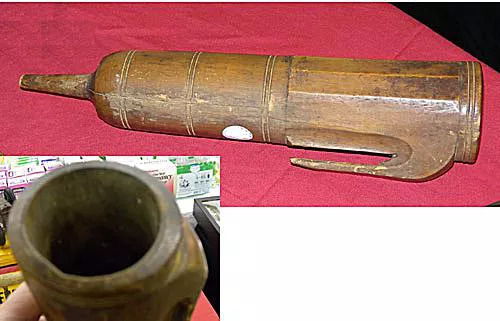 This antique was featured as a Mystery Antique of the Week in March 2012. This is an antique Stanley 66 Marking Gauge made of rosewood. 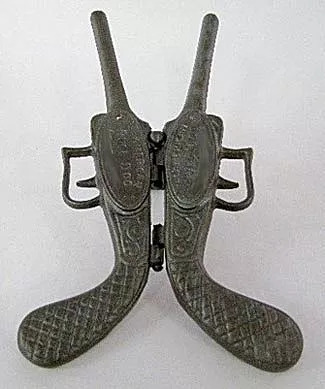 Cricket Bootjack believed to be made by the Harbster Brothers in Reading Pa in the mid to late 1800s. This particular bootjack belonged to the Flack family in Chambersburg, Pa. Note, family records tell how it was repainted several times, so no, that is not the original finish. This was part of the Mystery Antique of the Week series and was fittingly submitted by Debbie Hadley, Guide to Insects on About.com.